Will Royal Enfield's new twin capture the classic looks of the Interceptor? Royal Enfield's success in India is based on its classic, retro-styled Bullet motorcycle, with its origin going back to the 1950s. The 2014 Royal Enfield Continental GT evokes the time-honored appearance of the cafe racer of the 1960s. 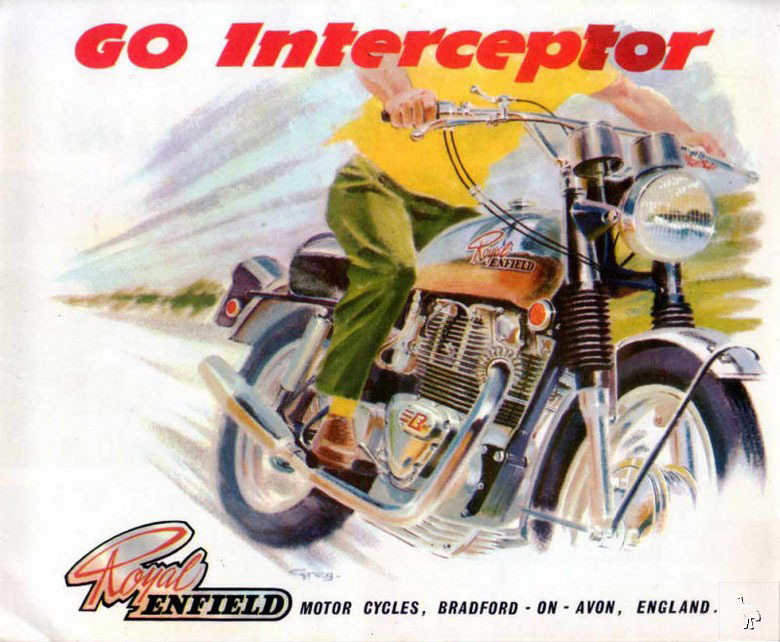 The new Royal Enfield parallel twin, rumored to be near introduction, likely will remind riders of the Royal Enfield Interceptor, last built in Britain up to the 1970s. True, the newly launched Himalayan dual-sport bike demonstrates that Royal Enfield can create a contemporary looking design. But, otherwise, the company's portfolio is a string of motorcycles based on the styles of the past. Under that old-fashioned style is modern hardware like fuel injection, electronic ignition and disc brakes. 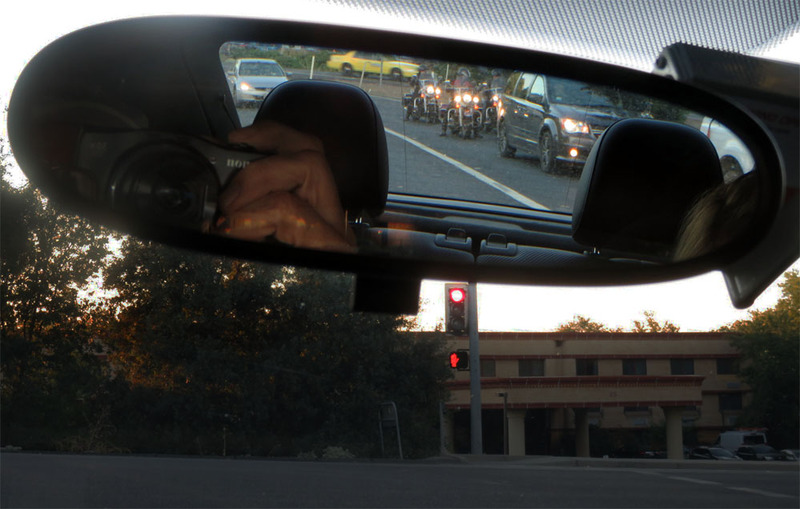 These features are expected by modern motorcyclists, but they can get them almost anywhere, on any motorcycle. 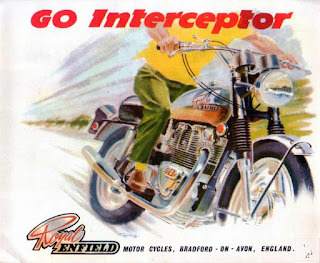 Royal Enfield is where you go to get your retro; and that is a marketing strength. A really retro-inspired design confronted me this month when our rental car on vacation in California and Oregon turned out to be a Volkswagen Beetle. I'd never driven one before. Our rental VW Beetle and a 1957 oval-window version. Volkswagen markets the car as "The original original." The shape, though sleeker than before, is instantly recognizable, of course. Otherwise, we quickly found it a typical modern car. But there was one retro touch that really was clever: The rear view mirror. Yeah. If you look at the back of a new Beetle from the outside, it has an unexciting, rectangular rear window. The rear view mirror itself, however, is oval. Rear-view mirror is oval, even though rear window is rectangular. This means that, as you sit in the driver's seat, your rear-view through the mirror is, of course, oval. You see out the back much as you might through the oval rear window of the original Volkswagen Beetle, back in the day. I don't even think the original Beetle had an oval rear-view mirror. Never mind. The use of this shape in the new car is a subtle but effective retro touch. Despite the car's other virtues (including a rear-view camera) it was the oval mirror I liked best. in the 1920s, lighting was so dim it was impossible to read or play cards. 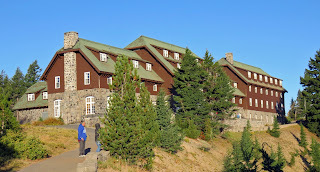 I was still thinking about retro when we arrived at the historic looking lodge at Crater Lake National Park. It completely fulfilled my expectations of timber construction, big rock fireplaces and dormer windows overlooking the lake. But — no — it isn't a restored original. Construction on a lodge had begun in 1909 and there were expansions in the 1920s, but there was never enough money to do it right. It was cheaply made and cheaply furnished and was described as "a fire trap of the worst kind" as early as 1940. Incredibly, the lodge was never originally completed. "The original plans, if any ever existed, have never been found," a history of the lodge reports. The redesigned lodge looks just as grand, but meets modern standards. The Park Service acquired the lodge in 1967 and kept it in operation, but eventually proposed tearing it down. There was a public outcry to save what was one of the oldest public buildings in any national park. The Park Service changed its tack. The lodge would be "redesigned." Very little original material could be preserved — even the original foundation had been nothing but rubble — but today the lodge is a modern building with the appearance of a building of the late 1920s. 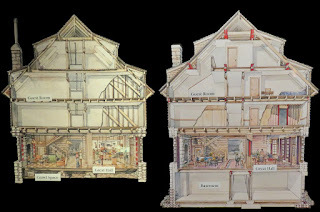 Diagram at the lodge illustrates old (left) vs. new (right). It's safer, sounder and has many more private baths. The effect is splendid, truly transporting the visitor back in time. One small touch I loved: the interior designer insisted on separate hot and cold spigots for the sinks, as the lodge would have had a century ago. Like the Beetle's oval mirror, and the water taps in the lodge, little things can mean a lot. I hope Royal Enfield reminds us of this when the new twin is revealed. a kick lever would be a "start"
how about a manually adjustable steering damper knob like the old friction type?